Thai Culture, Food, and Travel. Boon Songkran (บุญสงกรานต์) is Month #5 of Heet Sip-Song – The Twelve Isan Merit-Making Traditions. Songkran is the Thai New Year, and it's by far the most important holiday in all parts of Thailand. Because of the enormous number of migrant workers who leave their homes to work in Bangkok and other cities, for many families in Thailand, Songkran is the only time they can be together. So everybody who is able travels back to the family home during this week. The defining feature of Songkran is water – which is why in English it's often just called the "Water Festival." Towns become free-for-all water-war zones with everyone, young and old, drenching each other. Pick-up trucks loaded with barrels of water and little kids with giant squirt guns patrol the streets, and nobody is immune from a dousing. It's all great fun and fantastically refreshing since April is the hottest month of the year. Songkran's modern hijinks come from ancient traditions. Water is considered pure, so it can wash away bad luck and negative emotions, and bring good fortune in the new year. And despite the images and videos most people see, the true spirit of Songkran is a gentle pouring of perfume- or flower-scented water on the shoulder or down the back of the neck followed by a blessing such as kaw hai mee kwam-suk ("May happiness be with you"), suk-san songkran ("Happy Songkran") or sawatdee bee mai ("Happy New Year"). People aren't the only ones who get wet during Songkran. Families flock to temples to bathe the Buddha statues with fragrant water. And in some places the holiest Buddhas are paraded around town. Senior monks also sit for a ceremonial splashing at their temples. This is why Songkran used to be called Boon Song-Nam ("bathe") in Isan. Another core Songkran tradition is the building of phra chedi sai ("sand pagodas"). 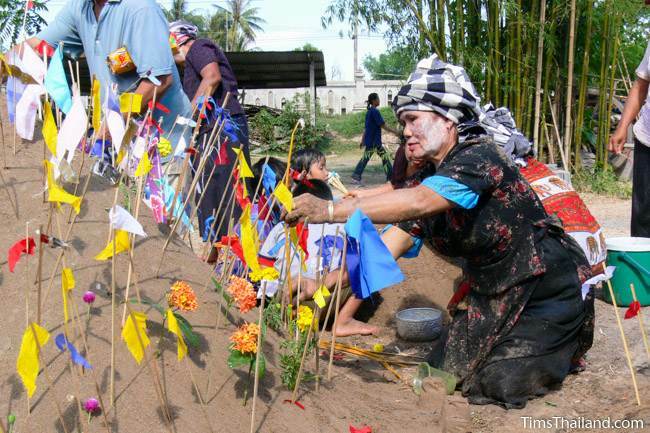 In the old days people brought sand to their temple during Songkran to compensate for the soil that they had inadvertently carried away on their feet during the rest of the year. These days, sand is trucked in and the pagodas are built bigger than before. At some temples people spend hours on elaborate constructions with the best earning prizes. Like the international New Year, Songkran is a time to celebrate, unwind, and look forward, but everyone also takes time to look back by paying respect to their parents and elders – by pouring water, of course; though in this case it goes over the hands. In the old days, the young ones would pour water for an actual bath and present them with new clothes or towels. This expression of parental gratitude is more important than the modern, official mother's and father's days later in the year. There will also be a ceremony to pay respect to ancestors. Thais celebrate Songkran for at least three days, and like Christmas, this holiday features a lot of sanuk ("fun") along with the spiritual side. Besides the water wars, there are concerts, fun fairs, boxing matches, parades, and much more. But while many people loudly lament the degradation of the holiday, celebrating with uninhibited exuberance is actually not a modern corruption of Songkran. Letting loose has been a part of Songkran in Thailand for at least a century, and probably beyond that. For most people these amusements are in addition to, not instead of, the religious traditions. And no matter how much fun people are having, or how they're having it, the real soul of Songkran lives on. Boon Songkran is no longer set by reading the skies. It is fixed to April 13, though some temples celebrate on other days if that's more convenient for the community. Proudly powered by WordPress | Copyright © 2017-2019 Tim Bewer, Khon Kaen, Thailand. All Rights Reserved.